Next week I get my life back. If you're a teacher, you know what I mean. School's out, and suddenly we all emerge from the cocoon of the classroom and stand blinking in the bright sunlight of our own personal lives, wondering blankly what to do with them. For the past 13 years, I've been working with high school musicians, specifically singers, as the piano accompanist for choirs in a magnet school for the arts. In the world of vocal music, the months between February and May are extremely intense. First comes District Solo Ensemble Festival, close on the heels of the Valentine's Cabaret. Then District Choral Festival, followed closely by State Solo Ensemble. Then "The Musical" (Hello Dolly this year), State Choral Festival, Spring Concert, Tour Competition (in Washington DC last weekend) - which brings us (WHEW!) to "Movin' On," the final showcase concert for Choralation, our senior ensemble/show choir. This is a very poignant concert, as the title suggests, with each senior singing a lyric from the song which gives the concert it's name, ending with "I just keep movin', cause it helps to ease the pain." Needless to say, there are many tears, probably the most heartbreaking of which come from the "tough guys" who never fail to sob the hardest. This year's crop is particularly talented and very close. There's Liz (whose mom has been in and out of hospital for the past four years being treated for bipolar disorder and alcoholism) who still manages to be editor of the school paper, earn first place awards at vocal festivals, and handle a starring role in the musical. She's off to Western Michigan University on a journalism scholarship. There are Vinnie and Matt, the "Martin and Lewis" of the department. Inseparable since kindergarten, they travel on to pursue their thespian dreams-one to Los Angeles, the other to New York. And Eden, the star of every show that goes up at school, also famous for losing her wallet in every city she's visited in the past year, also going to LA to study acting. David, the meterologist in training, Tyler, who has "always wanted to be a city planner (what an odd dream for a child to have! ), "Dr." Teresa, who always listens to everyone's problems and wants to open her own psychology clinic. The list goes on. Next year's group of seniors is just as diverse and talented. Difference is, I won't be there on the sidelines as the dramas of their lives unfold. Their director, my good friend Pat, is retiring after 18 years of gently guiding young people toward the fulfillment of their dreams. She has done amazing things for her students, and I have loved riding her coattails. 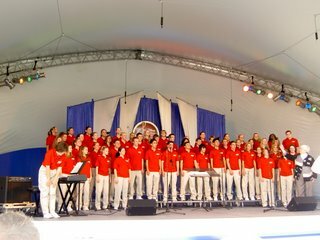 As her first bunch of graduates heads into their 30's, we've loved watching their college and professional performances, attending school concerts for those who have become music teachers, being part of their life experiences like weddings and baby showers, and sadly enough, leading a group of alumni in singing at a funeral. So as this era of my life comes to a close, I stand in the glare of more than just the ususal three months away from school. I'll be looking for other ways to keep my fingers limber on the keyboard (the one with 88 ivories that is!) I'll also be looking for ways to replace the energy, spirit, and enthusiasm that just oozes out of teenagers and leaks onto everyone who spends time with them. Any ideas? Newer PostI Belong in - Dublin?